An ecosystem is all the living organisms in an area along with the nonliving, or abiotic, parts of their environment. The abiotic parts of an ecosystem include physical substances such as soil, air, and water; forces such as gravity and wind; and conditions such as temperature, light intensity, humidity, or salinity. Physical substances can include organic materials that were once alive, such as bits of wood from trees, rotting plant material, and animal wastes and dead organisms. The physical substance of an ecosystem also includes inorganic materials such as minerals , nitrogen, and water, as well as the overall landscape of mountains, plains, lakes, and rivers. The organisms and the physical environment of an ecosystem interact with one another. The atmosphere, water, and soil allow life to flourish and limit what kind of life can survive. For example, a freshwater lake provides a home for certain fish and aquatic plants. Yet, the same lake would kill plants and animals adapted to a saltwater estuary. Just as the environment affects organisms, organisms affect their environment. Lichens break down rock. Trees block sunlight, change the acidity and moisture content of soil, and release oxygen into the atmosphere. Elephants may uproot whole trees in order to eat their leaves, beavers dam streams and create meadows, and rabbits nibble grasses right down to the ground. Ecosystems are not closed; in fact, an ecosystem's boundaries are usually fuzzy. A pond, for example, blends little by little into marsh, and then into a mixture of open meadow and brush. A stream brings nutrients and organisms from a nearby forest and carries away materials to other ecosystems. Even large ecosystems interact with other ecosystems. Seeds blow from place to place, animals migrate, and flowing water and air carry organisms—and their products and remains—from ecosystem to ecosystem. All ecosystems taken together make up the biosphere, all living organisms on the earth and their physical environment. The biosphere differs from other ecosystems in having fixed boundaries. The biosphere covers the whole surface of the earth. It begins underground and extends into the highest reaches of the atmosphere. Ecologists divide the living, biotic part of an ecosystem into two groups of organisms: the autotrophs and the heterotrophs. Autotrophs, also called primary producers, are organisms that make their own food. The vast majority of autotrophs (literally self-nourishers) are either plants, algae, or bacteria that use sunlight to make sugars from carbon dioxide in the air through photosynthesis. Heterotrophs (which means "nourished by others"), also called consumers, are organisms that consume other organisms. Heterotrophs include animals, protists, and bacteria, or fungi. Animals that eat plants, such as deer and caterpillars, are called herbivores. Animals that eat other animals, such as mountain lions and wasps, are called carnivores. Decomposers are heterotrophs that feed from the carcasses of dead animals or dead plants. If they are animals, such as millipedes, lobsters, starfish, clams, and catfish, scientists sometimes call them scavengers. Many animals, including starfish, lions, hyenas, and humans, change from carnivore to scavenger and back, depending on what food source is available. Some of the most important decomposers are nearly invisible. These are the detritivores: fungi, bacteria, and other organisms that feed on the remains of dead plants and other organisms. Each year, detritivores break down the remains of millions of tons of dead plant and animal material, recycling nutrients back into ecosystems around the world. Because animals eat one another, they can be linked in food chains, where, for example, a hawk eats a snake, which has eaten a ground squirrel, which has eaten a seed. Every ecosystem has numerous food chains that interlink to form a food web . A food web can change over time. In one year, a population explosion of oak moths means that insect predators focus on oak moth caterpillars. In another year, oak moths are rare, and predators eat a diversity of other herbivores. 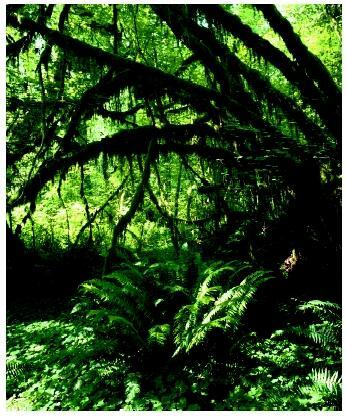 A temperate rain forest. Rain forests have more organisms per square meter than any other ecosystem. Every ecosystem is unique, yet similar ecosystems share fundamental characteristics, including climate, productivity, total mass of living organisms, and numbers of species. For example, tropical rain forests have higher species diversity than temperate forests. In the same way, marshes all have high productivity and deserts all have low productivity. Primary productivity is the amount of energy captured by primary producers during photosynthesis on a square meter of land each year. One factor that determines productivity is latitude and its effect on sunshine. A square meter of land near the North Pole, for example, receives about 700,000 kcals (kilocalories) of sunshine per year, while the same area at the equator receives nearly 2.5 times that much sunshine. So all things being equal, the tropical region has the potential for higher productivity. However, even in the same latitude, primary productivity varies enormously from ecosystem to ecosystem. A marsh, for example, is twice as productive as a temperate forest, four times as productive as a wheat field, and thirty-five times as productive as a desert. Another important characteristic of ecosystems is total biomass, the dry weight of all the organisms living in it. Rain forests have more organisms per square meter and therefore more total biomass than other ecosystems, more even than the superproductive marshes. On land, the biomass of plants is usually greater than the biomass of herbivores, which is greater than the biomass of carnivores. The reason for this is that every chemical process releases energy in the form of heat. So producers can use only part of the energy from the sun to build their bodies; the rest is lost as heat. In the same way, consumers can use only part of the energy in plants to build their own bodies; the rest is lost as heat. Each trophic level passes along only about 10 percent of the energy from the one below. This generalization is called the 10 percent law. The 10 percent law explains why ecosystems have so few trophic levels and so few individuals at the highest trophic levels. If on a square meter of land, primary consumers store 15,000 kcal/year, herbivores will be able to consume only about 1,500 kcal/year from that meter, and herbivore-eating carnivores will only get 150 kcals, about as many calories as are in a cup of spaghetti. Carnivores must, therefore, roam over large areas to obtain enough to eat. All sunlight energy eventually escapes from the biosphere in the form of heat. In contrast, the biosphere constantly recycles water, carbon, and other materials. As materials move from one trophic level to another, they may change form, but they rarely escape from the biosphere entirely. A single carbon atom in a fingernail may have been, at different times, part of an apple, part of a trilobite in the ocean, part of a mountain range, part of a dinosaur, or part of the oil in a Texas oil well. Carbon, oxygen, nitrogen, phosphorus, and other materials all pass through many forms—both biotic and abiotic—in a system called a biogeochemical cycle. The biogeochemical cycles of materials such as carbon and oxygen involve the whole biosphere. Brewer, Richard. The Science of Ecology, 2nd ed. Philadelphia, PA: W. B. Saunders, Co., 1988. Kareiva, Peter M., ed. Exploring Ecology and Its Applications: Readings from American Scientists. Sunderland, MA: Sinauer Associates, Inc., 1982–97. Molles, Manuel C. Ecology: Concepts and Applications. Boston: WCB/McGraw-Hill, 1999.